Hardy to zones 6 to 10. Evergreen perennial native to the Mediterranean, Europe, and Russia. 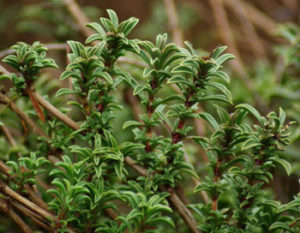 The dark green, shining leaves are esteemed for making tea. Source of thymol. Bright green-leaved aromatic shrub. Harvest the preflowering tops several times in the summer, shade dry, and rub out the stems. This makes good spice. Traditional usage (TWM): Carminative. 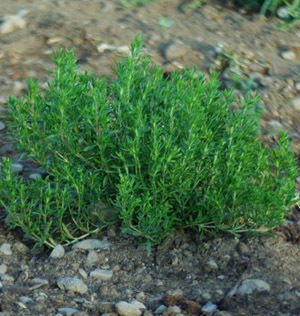 Plant prefers full sun, regular garden soil, and once established will stay green even if watered very infrequently. Space plants 2 feet apart. Flowers to 2 feet tall.